Want Your Employees to Be More Engaged At Work? Start By Understanding Their Motivational Values. Incentives and rewards have been used as early as the Industrial Revolution by a vast majority of corporations to fix one of their biggest problems – employee motivation. This strategy has been thought to increase productivity levels as well as align workers with the mission of their company. As workforces become more creative and self-motivated, many traditional types of incentives alone are no longer doing their part to motivate employees. The responsibility now is for companies to create better workplace cultures that foster their people as individuals. According to Dan Pink, your employees become truly motivated when there is a synonymous relationship between mastery, autonomy, and purpose. Only when you incorporate these 3 elements into your company’s day-to-day work processes will your company’s values align with your employees’ interests and goals. 1. Share the vision and long-term goals of your company. In a recent study conducted by Entrepreneur, “60% of employees didn’t know their company’s vision.” In retrospect, many people come to value the underlying purpose and principles their companies exhibit. However, if it’s not made clear to them from the start, they might quickly lose interest or become discouraged in the work they are doing for the company. Promote your company’s vision and goals by ensuring they’re always visible and put into practice. Making them a focal point and putting them in the hands of every employee, no matter their level, will help improve understanding of their contribution. A few examples could include developing activities that revolve around the organization’s unique culture or writing a small thank you note to an employee who consistently and visibly demonstrates values aligned with the company. 2. Give employees individual attention. Looking at your employees as individual people rather than a number relative to your bottom line has become an industry standard. Motivating and retaining workers that believe in the work your company is doing only comes naturally when it is clear they are valued. For this reason, keep your eyes open for ways to go above and beyond the expected. It creates loyalty among your employees that is hard to break and shows you care about life outside of work. Making time for the small things is also key. But how do managers at larger corporations make this happen with so many employees and so little time to spare? 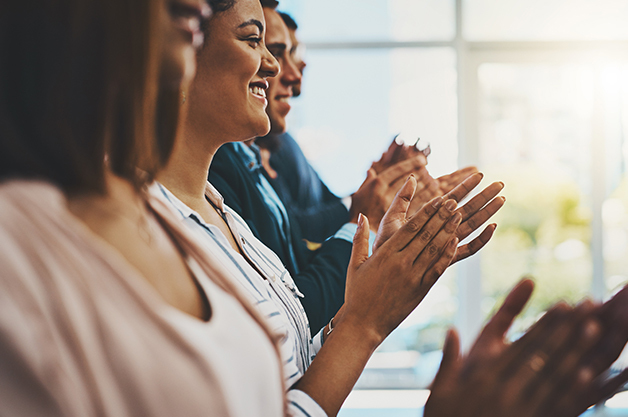 A simple conversation or acknowledgment of a job well done can prove their purpose and communicate the message that they are respected team members. 3. Offer clear opportunities for advancement and improvement. When you set clear, concise (and realistic) expectations for employees, they are able to see a clearer path to meet and exceed them. But one of the leading causes of employee turnover is a lack of clear paths for advancement and overall career growth within the company. According to the Harvard Business Review, “some managers neglect to think about what an employee is personally trying to accomplish in the context of work.” To prevent this, routinely and consistently ask employees what personal goals they have. Finding the common ground between their intrinsic values and the goals of your business will allow them to find more ownership or autonomy within their work. You can then find areas that can be adjusted to meet their goals and in the end, benefit both parties to create a harmonious relationship. 4. Create an inspiring work environment. Among one of the top factors that influence our performance at work is the space in which our ideas are formed. Give employees the freedom to try working remotely from different locations and see the sharp increase in productivity almost immediately. Another method that works in tandem with remote work or in a traditional office environment is the ability to work during peak productivity hours — for some employees, this could be 6:00 to 2:00 and for others, it might be 10:30 to 6:30. Open the door to these possibilities and watch the positive results flow in. 5. Present chances to talk about new ideas and methods. Successful companies want employees to utilize their creativity and innovation to formulate the best solutions to business challenges. But it’s difficult to innovate when employees end up having to operate under the premise of: “This is the way it’s always been done and this is how it will stay.” To prevent this, start by defining the boundaries for creative risk-taking and encourage your employees to think outside-the-box, then actually implement this strategy. Help them by generating “big picture” questions to find different the root of your business challenges like “What if…” and “How come…”. “Scenario planning and pre-imagining ethical challenges put you one step ahead when real problems arise.” (Fortune) If any employees are reluctant to think creatively, try telling them to start with smaller risks to step outside their comfort zone. In the end, they will feel like their opinion matters (which it does) and be a part of something bigger to contribute to your organization. 6. Hold less formal team-based events. Creating opportunities to get away from work also helps to create a purpose for your employees. While productivity is always important, it benefits people to step away and give them room to think. According to < Inc, how you shape your work environment has a major effect on your team’s mentality. Utilize outside gatherings, parties, group activities, volunteering or group lunches to give your employees a chance to socialize or recharge. Even something as simple as a group lunch can help your employees form friendships that make work more enjoyable. The stronger the bond your employees have with each other, the more they are emboldened to share their thoughts, insights, and ideas with other departments at all levels. This will also create an “open door” policy that helps your company flow more seamlessly when problems do arise. Creating that sense of belonging overall plays a vital part in developing your employees’ motivation. Out of everything you can do to improve your employees’ motivation, being a leader in your company (no matter your level of expertise) can help create a lasting effect on the overall mentality of your workplace. Staying optimistic in the face of failure or when unexpected deadlines creep up without warning can show people how to act during periods of change or adjustment. Any employee will find more purpose and motivation working for a company that aims to conduct business in an orderly, well thought out fashion and continues to value quality over quantity. Observing what works best for your company and paying close attention to the qualities employees look for in a leader can greatly affect their behavior. It is important now more than ever to give your employees the sense of purpose, autonomy, and mastery they so eagerly desire from their jobs. Understanding how to implement these practices in your business will help you retain and motivate the type of employees you seek. Ultimately, it will make a lasting impression on those who resonate with your business and will want to adapt your company’s mission as part of their own.